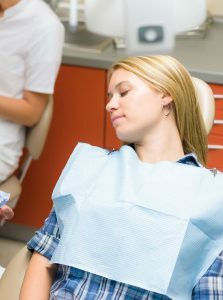 Can a Sedation Dentist Help When I Don’t Go Numb? I had a tooth cause me a great deal of pain. I’m not the best at going to the dentist but this did force me to go in. In a way, I’m glad I did because I found out that not only is that tooth massively infected, but I have two other teeth with decay. I need to repair those before they become infected too. The dentist offered to do it right then because I was his last patient and the infection was so bad. I realize that was incredible of him, but for some reason, he couldn’t get me numb. He did 11 shots. Yes, you read that right. 11 shots. He suggested I see a sedation dentist. He wasn’t certified and said I’d be better off with someone who was. But, what I’m wondering is if going to a sedation dentist will do any good at all if Novocain doesn’t help? First, I have to say you have an amazing dentist. He puts your well-being above both his personal time and his profits. So many times we receive questions from people who’ve had disastrous dentists. It’s refreshing to have a question from someone with a terrific caregiver. Your dentist is right that a sedation dentist is your solution. It’s often the case where people with severe dental anxiety, such as yours, are unable to get numb. The reason for that is the anxiety increases your metabolism. An increased metabolism burns off the numbing medication. You’ll need a strong type of dental sedation, like oral conscious sedation. You simply take a pill. That’s super simple. The pill completely relaxes you. In fact, it will relax you so much that you’ll need someone to drive you to and from your appointment. You’ll be too loopy to drive. That’s to your benefit. You’ll be so relaxed you won’t be anxious. This will allow the Novocain to do its job. Most patients end up sleeping through their appointments. Your dentist is also right that you’ll want someone who is certified. This is for your safety. Look for a dentist with DOCS Certification (Dental Organization for Conscious Sedation). This infection is serious. It will spread. If you think about how close your jaw is to your heart and brain you can see why, even in 2018, people still die from tooth infections. These type of infections are different than other types. You cannot simply take an antibiotic and be done. The dentist does have to physically remove the infected pulp. Another benefit to you is you’ll be able to get more work done in one sitting. That means you can get to those other teeth suffering from decay and have them filled in the same appointment you get rid of your infection. While the infected tooth will need a root canal treatment and dental crown. The other teeth will only need simple fillings as long as you get to them soon. Dental sedation will change the way you view your dental care. You’ll be able to get regular checkups done without the anxiety you’ve normally been faced with. Preventative care saves you a ton of money and trauma, because it either prevents problems altogether or catches them so early you only need minimal, non-invasive treatments.